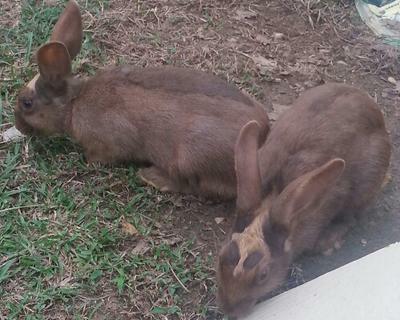 Hello, These rabbits are sisters and are about 4 or 5 months old. The people I bought them from said they are rare chocolate English Spot, but I want to make sure. They are brown with darker brown spots on their noses, foreheads and backs with blonde spots and the distinctive markings on their foreheads. They also have a grey-ish white undercoat. Can any one look at the pic and let me know for sure please? I think someone may know straight away what breed the rabbits are. Comments for What breed are my bunnies? They at some of the rarest breeds thay look like the beljium hare but a rare breed of one...they are worth quiet a lot my uncle had one and paid 160$ for them i wonder how much they are now days?